Devon Cricket League vice-chairman, fixtures secretary and Tavistock cricketer, Phil Bees, will be competing in the London Marathon to raise funds for the Alzheimer’s Society. This will be Phil’s first attempt at the 26 mile, 385 yard distance and the April 24 run comes just six weeks before his 60th birthday. 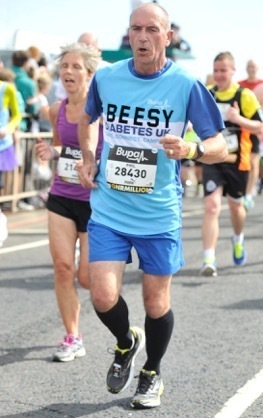 In September 2014, Phil ran the Great North Run – a mere half-marathon – in aid of Diabetes charities after his then three-year-old granddaughter, Paige (daughter of Cornwood cricketer Andy Bees) was diagnosed with diabetes earlier that year. A sum of £2,375 was raised. This time around, Phil was lucky enough to get a ballot place (a one-in-15 chance), where runners don’t have to run for charity. As his father-in-law, Jack, lived with dementia before he died three years ago and his mother-in-law, Beryl lives with dementia now, Phil decided to sign up to raise funds for the Alzheimer’s Society. ‘Whilst I am under no pressure to raise a specific sum by the charity, I would love to get in excess of £2,000 again, to help fund a desperately needed cure for what is a horrible disease,” said Phil. “I am currently just over half way to the target." http://uk.virginmoneygiving.com/PhilBees, send a cheque to 49 Buena Vista Drive, Glenholt, Plymouth, PL6 7JF, or phone 07425 154289 to request bank details.